A new Canadian study shows more young children than ever are being hurt -- some seriously -- by falling TVs. The top-heavy, flat-screen TVs can tumble onto children and crush their small bodies, causing brain or nerve damage, researchers say -- and in the worst-case scenario, even fatally damage their skulls. "Children are small and the first point of contact is the child's head," Dr. Michael Cusimano, a neurosurgeon at St. Michael's Hospital, told CTV News. The study found that children who are most at risk are toddlers, as they may climb onto unstable furniture where TVs are sometimes placed and not secured to a wall. "They open a drawer, climb up to try to reach a toy and the TV has a centre of gravity that is quite high and it falls on the child with devastating consequences," Cusimano said. The study was published Tuesday in the Journal of Neurosurgery: Pediatrics. 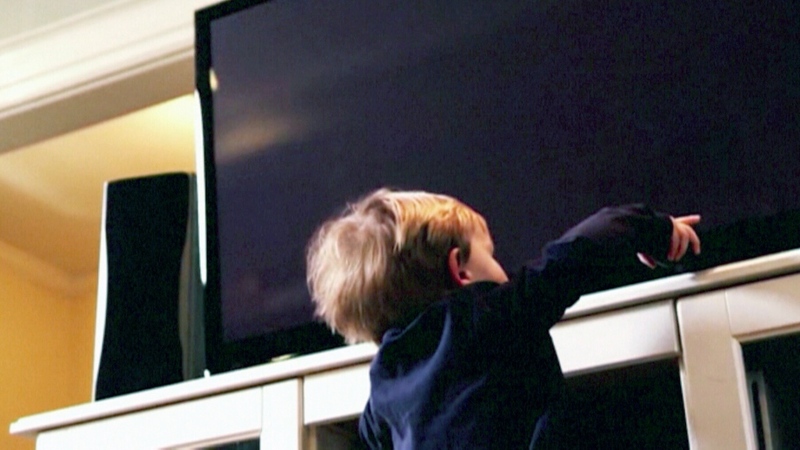 Cusimano and co-author Nadine Parker reviewed 29 studies from seven countries and found tens of thousands of children have been harmed by falling TVs. About 85 per cent of those cases occurred at home where TVs are sitting atop furniture. And in more than 75 per cent of the cases, a caregiver was not watching at the time. Injuries can also happen when parents are keeping an eye on their children. Mother Tracy Smith said her husband had turned around to grab his keys when a TV that was perched on a table at a summer cottage toppled onto their then-22 month old son Everett Smith. The falling TV left Everett with multiple skull fractures. "(TVs) can really, really hurt a child," Smith said. Everett is now 8-years-old and has since recovered from his injuries, but his mother still warns other parents to take precautions. "My message to parents: don’t wait another day without (putting) your TV in safe place," she said. "Make sure the kids can't reach it." The study found that nearly 40 per cent of cases reported skull fractures, and about 15 per cent resulted in bleeding in the brain -- which can sometimes lead to paralysis or even death. 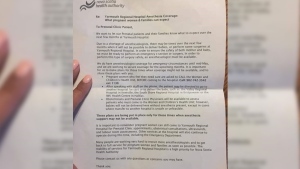 In one case that happened after the study was submitted to the Journal of Neurosurgery: Pediatrics, a two-year-old who was treated at Sick Kids died after an 81-centimetres (32-inch) TV fell off its stand and fractured the child's skull. The study also found that older children between two- and five-years-old are also susceptible to injuries as they spend more than 32 hours per week in front of TVs. Last year, a young Calgary girl was killed by a falling television when it struck her head. Isabelle Burwell-Keck's family said the six-year-old was reaching for some clothes in a dresser when a tube or box TV toppled over and fell on her. Isabelle was rushed to hospital, where she later died of her injuries. Research is sounding the alarm on a growing number of injuries involving children and toppled-over televisions.